How was White’s Grove named? In 1946 my father, Webster W. White, Sr., saw this property listed in a farm journal. The listing didn’t mention the lake at all. It was only listed as a farm. Dad knew the property and the lake because he had been here before. He bought the property from Fred and Rosie Gove. Their pine grove down at the lake was known as Gove’s Grove. The property consisted of about 175 acres of land, two old colonials on Route 156 and two old cottages in the Grove. Dad agreed to let the Goves harvest the pines, except for the ones in the Grove. Most of today’s pines are a second growth forest. Fred and Rosie were elderly and had no children. They were living in the 1765 white colonial that had been built by their ancestor, Jonathan Gove. My house, the 1837 red colonial, had been built by their ancestor, Samuel Gove. In 1946, there were about 20 cottages in the Grove. Some of the first ones may have been hunting and fishing camps. The road was one of the shortest ways into the lake. It was impassable during the early spring rainy and muddy season. If someone wanted to build a place in the Grove, Fred would tell them to go down to the lake and pick out a site. He then charged them $10 a year for land rent. He never sold them the land. Some of the cottages in the Grove are the originals but a lot of them have been replaced. After Dad bought the property, the Grove was known as White’s Grove. You mentioned that your father had been up here before? My father grew up on the coast of Maine on a farm that was about 50 miles south of the Canadian border. After high school, he enlisted in the service and was in France during World War I. After the war, he went to college in Maine. He was older than most of the college students so they nicknamed him, “Gramp”. When Maine didn’t offer the courses he wanted, he transferred to UCONN College in Storrs, CT. He was a very good athlete. He played football at UCONN and was captain of their baseball team. He met my mother Lottie there. She was a secretary to a couple of professors. They got married and upon his graduation, they moved to Westport, MA for his first teaching position. Later on he took a teaching position at Nashua High School. He taught US History and coached their track team for 18 years. I was their third child and was born in Nashua. We lived on Amherst Street until I was 4. Then Dad bought a 24 acre farm in Hudson. As well as teaching in Nashua, he raised chickens and had a big garden. He really did have a “green thumb”. He sold chickens, eggs, and vegetables to a Nashua diner. Some days, when we were hoeing and weeding, it seemed as though the rows of vegetables went right out of sight! Through his chicken raising, Dad met Grant Jasper. He owned a couple of chicken farms in Hudson. Grant and Bernice also owned a cottage in Gove’s Grove. It was seasonal, like all the other cottages. At that time, no one lived in the Grove year-round. The Jaspers, my folks, and a few friends would spend a weekend in late spring getting the Jaspers’ cottage ready for the season. The women would bring casseroles and food and clean while the men worked on the boats, dock, and beach. At night, they would all play bridge. Nancy Jasper, their youngest daughter, was a classmate of mine in Hudson. We were good friends and I was invited up to their cottage for a few days in the summer and sometimes in the early fall. At 10, we were good swimmers. We enjoyed the lake and their 3 canvas kayaks and aluminum canoe. When I was 13, Dad sold the Hudson farm and we moved to Raymond. The position of principal had opened there. Dad had his Masters Degree from UNH by then and thought he’d like to try being a principal. While in Raymond, Dad met a man who had done very well financially in developing Smith’s Pond into Governor’s Lake. Dad wanted a farm and when this property came up for sale, he saw his chance to have a farm and to develop some of the lake land. Did you move to the Grove after purchasing it? No. After two years in Raymond, Dad decided that he liked teaching better than being a principal. He took a one-year position at New Hampton Prep School, teaching History and coaching some of their Junior Varsity teams. By then he was looking to retire in about 10 years. A teaching friend, who was teaching at Cranston High School in RI, told Dad that they needed a History teacher. He applied and taught there until he retired in about 1961. The year Dad bought this property; a road crew came to pave Route 156. Their boss asked Dad if he could have a temporary office in the 1837 house. Dad agreed and when the road was done, the boss told him that the house only had one leak. Dad had a new roof put on it and managed to save the house. When he bought this property, he didn’t even look into this 1837 house. No one had lived in it for a number of years. You can see from the old photograph what a mess it was! He just figured it would have to be torn down. This house is on big granite blocks and has a 10 foot deep cellar. After a few years, Dad started working on this house. He also had an enclosed porch built on one side of it. His idea was to sell the 1765 colonial and move the store over to this house. Yes. 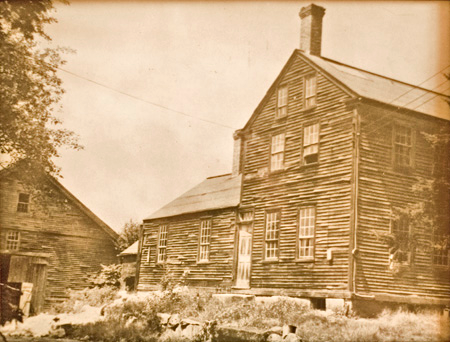 Rosie Gove ran a country store in the “L” of the 1765 colonial during the summer. We continued to run it for a couple of summers. The bread truck stopped every day to make deliveries. About once a week, we’d go to Manchester to the Cash & Carry to pick up soda, candy bars, etc. Two winters we had ice blocks cut out of the lake. They were put into a sawdust pit down at the shore. Dad insulated a small part of the barn so that he could bring ice blocks up in the summer and sell pieces of them in the store. We all learned how to ice pick off a 25 or 50 cent piece of ice for the campers’ ice box. Even after there was electricity in the Grove, most campers still used ice boxes for a while. We also sold the very pretty earrings and pins that the German families on the other side of the lake carved out of wood. Our counter was a showcase where we could put the jewelry and other small things on display. And we had a “biggest fish” contest. A lot of people, especially from the lake cottages, came into the store. They mostly came from Seaman’s Point, White’s Grove and Fernald’s Grove [Barderry Lane]. We soon got to know almost everyone on the lake. When did the family move up to Nottingham full time? Dad was 60 years old when he retired from teaching in 1961. He sold their home in Cranston, RI and moved to Nottingham. Dad gave the people who had built cottages in the Grove a chance to buy their lots. He did his own surveying and it was pretty accurate. Most of the lots are 50’ by 100’, with the 50’ on the shoreline. The cottages fit into that plan very well. He also sold the 1765 Colonial. My folks fixed up the two old cottages that had come with the property and started a summer rental business. A lot of families rented for one or two weeks year after year. Mom had a ledger with the weeks and cottages listed in it. It was an easy way to keep track of the rentals. We had a sign out on 156 which said, “White’s Cottages and Boats For Rent”. The Jordan family from Methuen rented our 1903 Ferncroft cottage for 24 years. Both parents were teachers and they had five children. They would be here all summer and weekends from their April vacation until Columbus Day. Ferncroft is one of the earliest cottages in the Grove and has 1903 carved into the porch. It is still just a summer cottage. I inherited it and mostly keep it for family and friends and sometimes rent it. My folks acquired a few more cottages in the Grove as they came up for sale. Dad sold a few back building lots but then decided he liked the Grove the way it was and so he gave up the development idea. Dad bought some row boats and started a boat rental business. He would tow them up to the State Park with an old motorboat and rent them to campers. Not many people had their own boats at that time. There were mostly canoes, sailboats and small motorboats on the lake. My father was friendly and made a lot of friends with people who came to the State Park and with those who stayed in cottages on the lake. There were a couple of seaplanes on the lake. The Holdens, in our Grove, and the Browns, on Seaman’s Point, owned them. One day, when Dad was coming back from the Park towing some of his rowboats, his motorboat conked out. Holden, who was landing his plane, saw that Dad needed help so he taxied his plane over to Dad and towed him and his boats to shore. My oldest brother Webbie and I were both teachers by then. We lived in different states but would come up in the summers to help our folks. We were also working on Masters Degrees at UNH, only a 14 mile commute from here. In time, Webbie bought two old cottages in the Grove, built one new one, and joined the rental business. Later he built his home in the Grove and eventually retired here. When my brother Leonard came back from Korea, he decided to build a few cottages and rent them. Dad gave him a piece of land and in time, Rocky 1,2,3,4, and 5 were built He and his family would come up from Springfield, MA on weekends to clean their cottages He was an electrician and later moved up here into Rocky 4 and started White’s Electrical business. He and his son Jon ran this business. Rocky 5 is now a year-round rental. Rocky 1, 2, and 3 are still summer rentals. 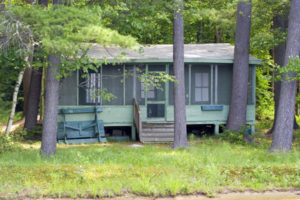 At one time, my folks and brothers had about 10 summer rental cottages. They were rented from Saturday to Saturday. Renters had to be out of the cottages by 10 AM and the next renters couldn’t come in until 1 PM, which gave us a window of opportunity to get them cleaned. Sometimes we’d be going out the back door as the renters were coming in the front door! But we all worked well together and helped each other, if one group of us finished early. Then we would all meet up in the folks’ yard and have lunch. Between the three of us, we had twelve children. They were known as, “the dozen cousins”. As they grew old enough, they helped with the cottages and the boats. The women and girls would clean the cottages while the men and boys took care of the boats, beaches, any repairs, and brought the trash to the Nottingham dump. The dump was an ecology dump even then. 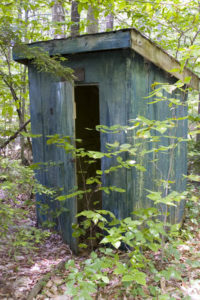 It may have been one of the earliest ecology dumps. We had a list of instructions posted in every cottage. One of the items on the list pertained to separating their trash for the ecology dump. The cousins knew each other well because they were here every summer until they were old enough to get summer jobs. As the folks got older, a couple of the cousins stayed with the folks to help their grandparents with the work, which also included a big garden. Dad was still raising a lot of vegetables! He would give a lot to the family and always leave some down on the well in the Grove for anyone to have. 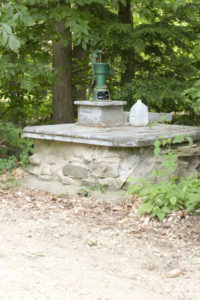 The well was the only source of drinking water in the Grove. The well was a hand pump one and was here when the folks bought this property. It still works! A lot of the cottages have their own wells now but some still use the old hand pump. Dad raised a big garden for years. He had an old International pickup truck. 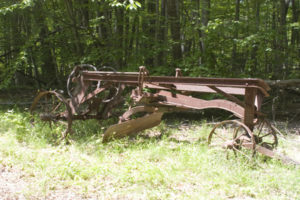 In the spring, he would attach an old plow to it. It had a seat and he would sit on that and guide the plow, while one of us would drive the truck up and down the garden area. He also had an old road scraper that had a seat on it. Again, he would sit on the scraper and guide it while one of us drove the truck up and down the road. I still have the old scraper. It made its last appearance in the parade that Nottingham had to celebrate the town’s 275th year. It was cleaned up, decorated, and towed behind Nottingham’s big new scraper. My grandmother had been living in Massachusetts. 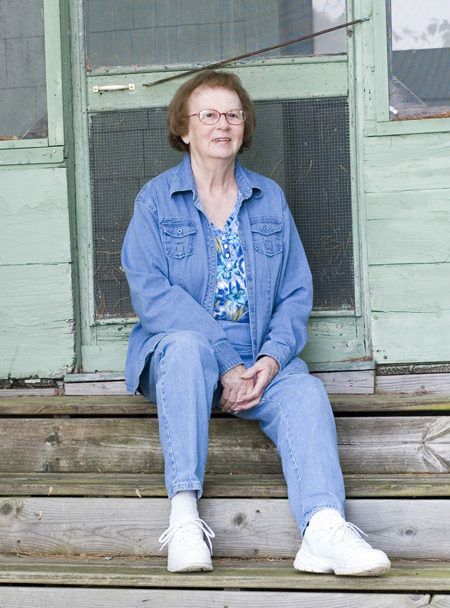 In 1954, she came here and had a seasonal cottage built across the field from the red colonial. She would rent in Florida in the winter. After she died in 1963, the folks rented it. Meanwhile, I had married a Westerly, RI fellow. We came up only briefly when our kids were small. When the kids were a little older, we decided to buy my grandmother’s cottage. My kids and I would spend the whole summer, helping with the work and having a good time with the family. My husband had a busy 24 hour wrecking service and garage in RI so he would come up anytime he could get away from the business. When our boys were older, they worked for their father in the summers. In 1989, I retired from teaching. My mother and I were both widows so I rented my RI home and moved to Nottingham. Growing up on the Hudson farm, I always enjoyed nature. Sometimes when I was here with the Jaspers, Nancy and I would take the canoe and try to find a way around the big island. On the maps of Pawtuckaway, it looked like that was possible. We were never able to do that. In the fall, when they took boards out of the dam and the lake was low, Nancy and I would canoe up through the North Channel and wade from island to island. The channels were open but you had to stay directly in the middle to make it through. With the water level so low it was the time that people worked on their shoreline. We were good swimmers at an early age so we were able to enjoy the boats and the raft. With a boat beside us, we often swam across to Chowder Rock and back. We hiked the Park trails, climbed up to the fire tower, and went to see the huge glacial boulders. Later, we did the same things with our kids. Our boys sometimes camped overnight on one of the islands. When we were teenagers, we would go to Canobie Lake and the dances that were held in a barn in the Onway Lake area of Raymond. Friends from around the Lake and from the rentals often went with us. We had a lot of fun at the lake and it always seemed like home to me. Four generations of our family have enjoyed the lake. It has been a great place for our family to get together. My parents would be very happy that their children, grandchildren, and great- grandchildren are still coming to White’s Grove and that some of us live here year-round. I myself have never lived down in the Grove. What were some of the most significant events that happened on the lake? My brother Leonard took out building insurance when his first cottage, Rocky 1, was being built. Everyone made a big joke out of that. Well, one day, a small tornado came zipping down the Lake. It went straight for Rocky 1 and knocked it flat! With the building insurance, he was able to have the cottage rebuilt for practically nothing. Len had the last laugh! We’ve been pretty lucky here when there are storms in the area. The storms will either go to the South of the lake or North toward Northwood. In 1954, there was a hurricane that came in off the coast and was supposed to go up the Connecticut River. My Folks and I had gone to Nashua to do some business. The hurricane came this way instead and we got stuck in Nashua for a while. With all those big pine trees in the Grove, we were very worried. We finally made it back to Nottingham by sometimes having to drive off the road and through some fields to get around all the downed trees across the roads. We picked up a woodcutter on the way before we got to the Grove. The only cottage that was demolished was the Lodge, which was right in the middle of the grove. A number of pines had fallen on it. An Irish family from East Boston with five kids and four adults were renting the Lodge at the time. They were some of our frequent renters. To our relief, none of them were hurt. They said that the first pine that came through the roof landed on the refrigerator. They managed to get out of the cottage and to a safe place before the other pines came down. The Lodge was rebuilt with the fallen pines. The family continued to rent for a few years. Anytime the wind blew and it looked like a storm was coming, they would go right home. Certainly can’t blame them! Has the wildlife on the lake changed over the years? No, I don’t think so. There were always loons on the lake, especially up in Fundy. When we were young, we would try to sneak up on the loons. When we got close, they would dive under and we would paddle fast to where we thought they would come up. They always came up somewhere else! There were always deer around. They would come through our property just below the house where the gate is. There had been some old apple trees in the field near the gate. Many times, when we were bringing kids back to the Grove from a dance etc., the deer would cross the road right in front of us. In the fall, when Dad went deer hunting and entered the woods, the deer would come past the house where my mother and I could see them from our windows. It was funny! They seemed to know where Dad was! He rarely got a deer! Dad was a very good fisherman, as is my bother Len and his son Jon. We often had meals of bass and perch. We still have fried fish fillets at our family cookouts. Other fish in the lake were pickerel, sunfish, eels, and hornpout. Some fished for the eels and hornpout at night. They would leave a lantern on the shore so that they could find their way home if a fog came up. What is the biggest challenge facing the lake community in the coming years? Our biggest challenge is to keep the lake as healthy as possible for the generations that come after us. I think that the PLIA is definitely on the right track. I thought the annual meeting was very good. I especially liked their video that showed how to landscape our waterfronts to promote a more healthy lake and a better habitat for the animals. I really liked the Pawtuckaway Kids program that will teach the children how to take care of the lake. Pawtuckaway is a wonderful place and we all need to keep it that way!